Pepsi Backlash: Does Beyoncé Have A Responsibility To Endorse Healthy Products? Late yesterday evening, Beyoncé revealed a preview from her Pepsi commercial, set to air after the Pepsi-sponsored Super Bowl half-time show on February 3, 2013, which she is headlining. 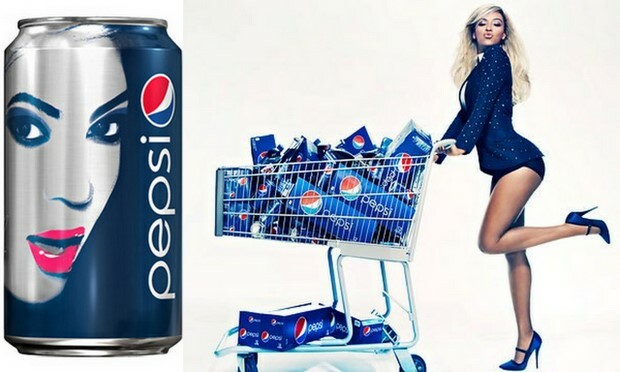 Beyoncé’s Pepsi commercial is a part of a $50 million dollar deal which names her the global brand ambassador to the brand and includes limited-edition cans, which show a pop art-inspired outline of her fully made-up face. The ad campaign will coincide with the release of new music from the superstar. Of the high profile collaboration, the singer, who has already appeared in four Pepsi ad campaigns, said: “Pepsi embraces creativity and understands that artists evolve. As a businesswoman, this allows me to work with a lifestyle brand with no compromise and without sacrificing my creativity.” Reactions have been mixed. Fans view the campaign as a momentous accomplishment for the singer, while others chide Beyoncé for supporting a sugary-soda brand which is a health affront to many American consumers. They even accuse the diva of hypocrisy for appearing in Michelle Obama’s “Let’s Move” initiative to encourage good health among children and later, shelling Pepsi cans. One commenter said: “Parkinson’s, heart disease, obesity, stroke and Alzheimer’s tincture. Another celebrity getting paid to keep America on their mainline like heroine. I respectfully decline supporting this travesty.” Another writes: “With diabetes and other ailments at an all time high, one would wonder why celebrities who claim to care so much about their fans would endorse soda. Almighty dollar.” While Pepsi isn’t great for your health, is it Beyoncé’s responsibility to make sure America drinks less soda? What are your thoughts, Clutchettes? Should Beyoncé only endorse products that promote good health?